As we've been saying for a long time, America's dangerously underfunded defined-benefit corporate and public pensions are little more than lavish Ponzi schemes designed to swaddle one generation of retirees with lavish benefits (a fixed monthly income and health benefits until death), while siphoning payments from a younger generation that will never reap the benefits (what's worse, these "contributions" have been climbing, even as funds have been forced to raise fees and contributions, which has done little to address the underlying issue). While public pensions funds have hogged most of the media spotlight, Congress has been quietly taking steps to address a more vulnerable sector of the pension space. To wit, a bipartisan group of lawmakers sneaked a provision into this year's budget deal that established a committee to decide how to prevent the retirement benefits of 1 million Americans from evaporating once thousands of failing "multiemployer" plans finally collapse into insolvency. That committee was given a deadline of Nov. 30 to propose a solution. And while many ideas have been bandied about (including raising fees, levies and contributions on healthy plans to subsidize their failing cousins), from the beginning, it's difficult to imagine how this $500 billion shortfall (the aggregate underfunding of these corporate pension plans, according to an estimate from Boston College) could be covered without the American taxpayer footing the bill. Adding to the urgency, nearly one-quarter of the 1,400 multiemployer plans in the US are in the "red zone," meaning they will likely go broke within the next decade. And if the recent bout of turmoil across virtually all asset classes continues, the day of reckoning could be hastened. Particularly if the low returns on conventional assets force these funds to place riskier bets on alternative strategies like hedge funds, something that many funds did in desperation during the ZIRP era. So it shouldn't come as a surprise that, in the first draft of its plan to save these pensions, the committee proposed restoring the Pension Benefit Guaranty Corporation (PBGC) to solvency with - you guessed it - taxpayer backed "subsidies" from the Treasury to the tune of $3 billion a year. The plan is also considering raising premiums, introducing new fees and - importantly - cutting benefits. The retirement programs are called "multiemployer" pensions, as workers from multiple companies pay into the same retirement benefit program. But many of these pensions lack the financial assets to cover the benefits they have promised retired workers, leading to a panic from retirees who were counting on the funds. These pensions often have been plagued by mismanagement, inaccurate economic projections and in some cases corporate bankruptcies. Unfortunately, that $3 billion isn't nearly enough to cover the shortfall, which is why the plan also calls for other streams of capital. According to the Washington Post, the leaked draft proposal is only a rough sketch of one of several alternatives being considered by the committee (translation: this is the trial balloon). What's perhaps most surprising about the plan is that it has bipartisan backing: This is a bipartisan effort, as neither party is ready for the political backlash of hundreds of thousands of retirees forced into bankruptcy and the poorhouse (after all, retirees vote). We bailed out Wall Street in 2008. So why can't be bail out the boomers, too? "We bailed out Wall Street in 2008 and 2009," said Kenneth Feinberg, who was appointed to a top role at the Treasury Department in 2015 working on problems with multiemployer pension plans. "Bailouts have occurred before." Of course, saving multiemployer funds would be like putting a band-aid on a gunshot wound. 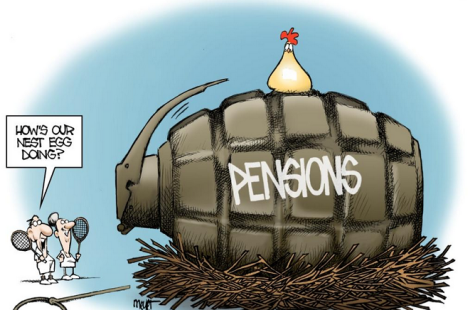 Because public pension funds are an even larger ticking time bomb . They're facing a $7 trillion shortfall, a problem that is almost too big to contemplate. But repairing the PBGC seems like a logical first step. Like the FDIC, the PBGC is an insurance program funded by premiums paid by its participating members (pensions). Its entire income is made up of premiums collected and the investment income it earns on those premiums. As WaPo explains, the PBGC, which was created in the 1970s, is extremely underfunded. The fund had nearly $70 billion in liabilities last year compared with $2.3 billion in assets. And since the fund's only sources of revenue are fees it collects from its members, and returns on its investments, once markets crash and more members start to fail, the drop in revenue risks triggering a vicious cycle. The Pension Benefit Guaranty Corp. was created by Congress to provide a financial backstop for pension plans, but the PBGC’s program to insure multiemployer plans is severely underfunded. It had $67.3 billion in liabilities as of last year and just $2.3 billion in assets. The entire fund is projected to run out of money by 2025, although the agency said "there is considerable risk that it could run out before then." Last year, the PBGC provided $141 million in assistance to 72 insolvent multiemployer plans, and there are several others listed as "critical" and likely to soon become insolvent. "When...people’s livelihoods will be lost, government has always stepped up to back its own creations," said Joshua Gotbaum, who served as director of the PBGC from 2010 until 2014. A pension-fund crisis could cause real, tangible harm to millions of Americans. Given the severity of the risks, it's surprising that they aren't more widely discussed. But then again, maybe that's by design.